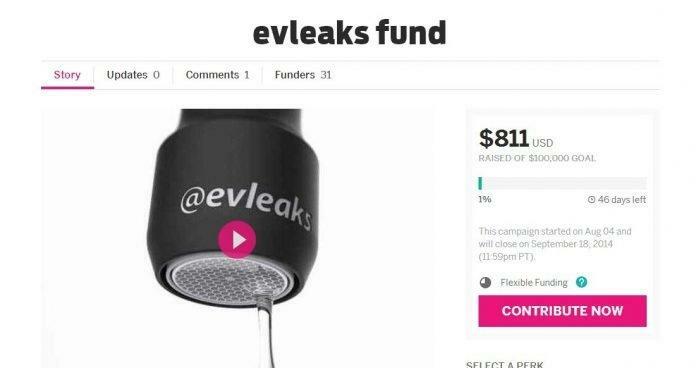 In our previous post we described why @evleaks is going to retired and in the interview with Thenextweb, the @evleaks founder Evan Blass explained who will be the next big leaker and it’s none other than TkTechNews, now TkTechNews started a medical campaign in Indiegogo to get some funds to save @evleaks, and the amount to be raised as funds is fixed as $100,000 and this campaign is stated a few hours back and it will run up to 46 days, i.e., up to September 18th. we all know what Evan Blass did in the tech news and leaking things, his many leaks are exact to the real smartphones and mostly he is been one of the best leaker untill now, and no one wants Evan to leave the @evleaks and get retire! we all can contribute and save @evleaks and make Evan Blass to get proper medical care and return home as a healthy person, and do the leaking stuff again! But with this campaign funding , we are not only able to make Evan to get back to Tech community, but also we are saying our sincere gratitude towards his work for the tech community, and i hope everyone do know about the disease that Evan Blass is suffering and i wish everyone contribute to save him and his work! Credits: TK O’Connor aka T.K.